Today, I didn't have time to write a proper blog post. Instead, I watched nine episodes of Star Trek: The Animated Series and worked on a huge illustration project I've been trying to finish up. When my husband got home he asked, "Where's your post for the day?" And, that's when I realized that I'd been so swamped, I hadn't written one. So, I sat down and made the following drawing. 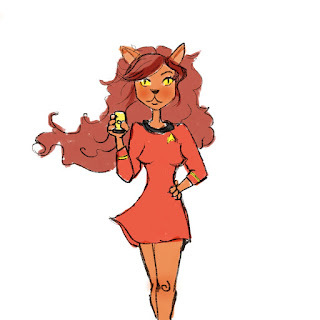 Just in case you didn't know, there's a cat girl (she's from the Caitan race) serving on board the Enterprise in The Animated Series. She's voiced my Majel Barrett-Roddenberry and she purrs when she talks. Her name is M'Ress and she's pretty M'Awesome. I love how you just "sat down and made the following drawing." Ridiculous talent, I tell you. Wow, you're really talented! I'm always blown away by people who can draw. My skills end with stick figures and those dogs you draw by adding loops to a circle.